I’m slowly getting into trying more Japanese skincare products. Lately, more Japanese beauty brands entered the US market and they can be found on the shelves at Sephora. All the Japanese skincare products I’ve tried so far, have been good to my skin. 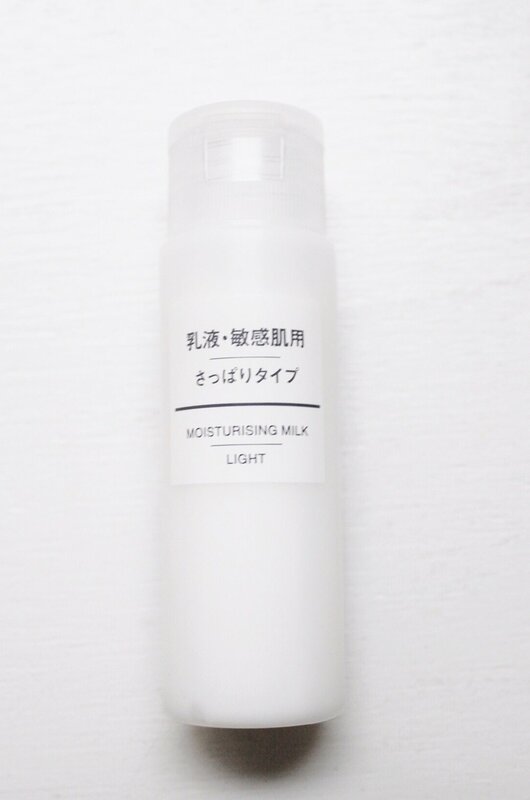 Today, I’ll be reviewing a moisturizer from Muji. For those of you who don’t know what Muji is, it’s a Japanese store which sells a wide variety of household and consumer goods. Including skincare. Their stationery products are amazing BTW! From their skincare line, I’ll be testing the “Moisturizing Milk Lotion” for sensitive skin. It’s worth to mention that Muji sells skincare products for the following skin types: normal, sensitive and mild. ✿ Has your dream minimalist packaging. ✿ Since it comes in a 50ml bottle (1.69 FL OZ for my American friends), it’s travel friendly. ✿ Ingredients that caught my attention: glycerin (makes skin soft), grape seed extract (helps suppress acne and eczema), purslane (also known as the hero ingredient; it’s used in treating eczema and acne-prone skin). ✿ When I first applied it, I didn’t put too much of the product in my hand, because I thought a little goes a long way. I was wrong. You need to put quite a generous amount of the cream on your face. HAVE YOU TRIED MUJI SKINCARE LINE?